Christmas 2015 has been here and already gone. As much as I love decorating and savoring all that is Christmas, I want my house back in order by the 27th. I put away all the decorations and clean pretty much all day, it’s become a part of my holiday ritual. With a young child, there is that much more to do now in terms of clean up. We now need to clean and organize her room and play area to accommodate the new gifts which she received. As much as I try to tell friends and family to please not buy/limit the gifts for her, they never listen and before I know it we’re researching contractors to do a house addition. While it’s not really that bad, we do have a finite amount of space to contain her stuff and so as objects come in, some must go out. Living in a house with minimal storage space is both a blessing and a curse. We don’t have a garage or even an outdoor shed. Take your basic house and think about closet space, that’s basically what we have to live with. We do have a very small storage/cold/laundry room which is 40% laundry space, 40% tools/work area, 10% food storage (we have no pantry either), leaving us with about 10% additional storage. Not much. So when stuff comes in our house we really have to consider how much we want it and if we do want it, what has to go to make room. 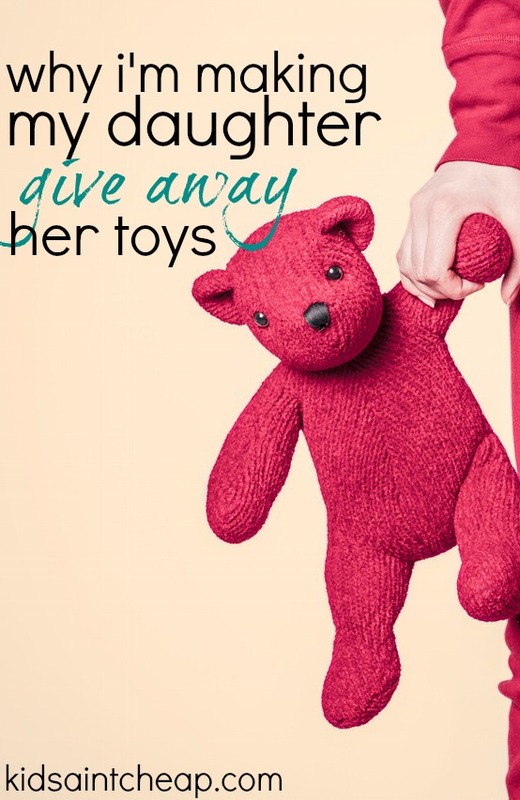 Thankfully most of the gifts my husband and I receive are pretty practical or very small in size, so we really do only need to work on our daughter’s stuff (why must some toys be so large?). I thought about sneaking into her room and doing a big purge, throwing it all in a big box destined for donation, but I decided it would be better to involve her instead. While I did go through her clothes, she will insist everything fits her forever, when it came to the toys, I put aside a bunch I thought she’d be ok with letting go as asked her to help me sort. I wanted her to be involved in the process of giving her toys away. Kids build attachment to toys and I needed her to understand that I wasn’t taking her toys away to be mean, but rather have her understand that she has been very fortunate to receive so many new ones and there are children out there who have much less than she does. Especially at Christmas time, I want her to feel like she was helping someone else. I’m the first to admit that my kid owns more stuff than I’m comfortable with but I think there can be a balance between giving and receiving. Not only is it important that she understands how fortunate she is, but by involving her in the process of giving to those in need she can learn compassion and gain a real life understanding of her situation. How do you manage the post-holiday toy clutter? very cool idea. we have so many (post holiday) toys laying around. This would clear up the clutter that we’re faced with and teach my boys a couple of great lessons.